soon it'll be that magical time of the year again! Shopping for Xmas presents for a newborn - whether as a parent, a grandparent, an uncle, an aunt, another relative or a friend - is fun and really easy now! Let me show you my favorite gifts for baby's 1st Christmas to make it a Holiday to remember. And in case you are searching for a toddler, have a look further down the page and you'll certainly get some cute ideas for pre-school kids, too. With a Christmas outfit or a Christmassy accessory you can never be wrong. Get a complete girl or boy Holiday outfit or just a single piece like a bodysuit. Since Christmas normally is the cold season of the year you should go for a long-sleeved outfit. It also would be a shame if you had to cover a short sleeved onesie with a long-sleeved shirt or sweater. If, of course, you live in a region where it's mild or even hot during Xmas time short sleeves are the choice! 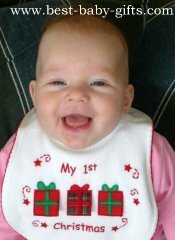 If you give a festive outfit there's another 'benefit': photos of baby wearing cute Christmas clothing are a great keepsake! Holiday outfits come with all sorts of sassy printed messages such as 'Baby's First Christmas' or 'Santa's Little Helper'. Festive accessories for little kids also come in several styles and designs: Christmas bibs, baby hats, socks or booties and extremely cute Holiday headbands and hair bows for little baby girls. Create a keepsake to treasure by giving a Christmas photo frame or ornament. Photo frames are a great decoration item at the Festive Season. They come in many forms and styles to go with every interior. And they are available in many materials such as wood, silver, gold or glass. Photo frames often have an engraving such as 'My First Christmas'. The yearly Hallmark 'Baby's 1st Christmas' photo holder is a classic. Here is the 2018 Hallmark keepsake ornament and also a number of baby's 1st Christmas 2018 ornaments. The personalized wooden engraved block ornament is awesome, too and it is handmade in the USA. Click the images for further details. Make your gift more personal with Baby's First Christmas Poems. Raffi's baby CDs always are a great present for babies and kids. And the one with the Christmas songs is no exception! Get this for the little one and in short the whole family will like it and hum along! We all love to listen to this album year after year. You know, there are children CDs that get on your (the parents) nerves after some time. This one, just like the other Raffi CD's, doesn't! Even I am looking forward to get this CD out at winter time. Together with my kids, we love to sing along while riding in our car. Songs included are 'Frosty The Snowman', 'Up On The House-Top', 'Jingle Bells', 'Rudolph The Red-Nosed Reindeer', 'Must Be Santa', 'We Wish You A Merry Christmas' and many more. This CD is a gift you can give to a baby already and it will last and bring joy for years! Check out the shopping malls and get a gift voucher so mummy can take baby on a photo date with Santa! This voucher can be given on its own. Or you might also like to combine it with the outfit to wear at the photo session, or also give a nice frame with it to display the best photo in. In that case, it is cute to insert the voucher into your frame. Alternatively, take baby (while you are babysitting) to the mall and have surprise photos for the parents taken. A photo of your daughter or son together with Santa also makes a great present from mummy for daddy or also from daddy for mummy! Cuddly Xmas toys are a classic gift for baby. They make a treasured companion not only around Christmas time but all year round. 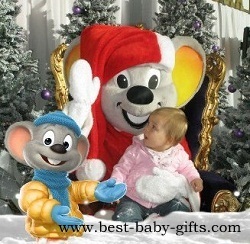 So make baby's 1st Xmas one to really remember! A stuffed Christmas teddy bear, a cuddly Elf On The Shelf or any other cuddly Christmassy toy is the perfect keepsake and giving for baby's first Christmas. 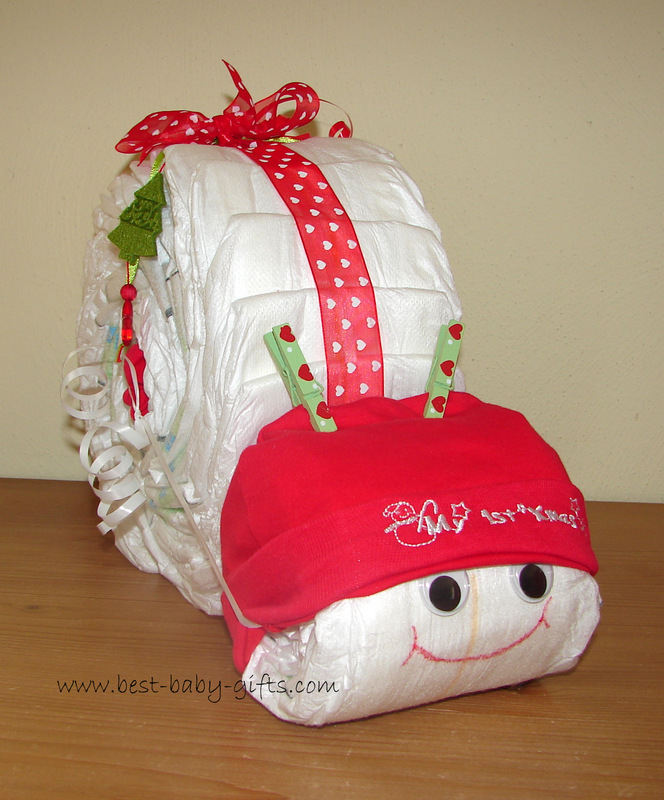 Find out baby's diaper size and mommy's favorite kind of diapers and make a beautiful Xmas themed diaper cake or a diaper snail as pictured here! On a traditional pampers cake you can even put a Santa baby hat on top. Add Christmas goodies, a festive garland and if you like also real Christmas chocolates or candy canes for mum and dad. Just use your imagination (and google for photos) for a really Xmas diaper gift for baby. Click here for step-to-step easy diaper cake directions and diaper snail instructions. Sometimes giving cash or a giftcard is a good idea, too. After all baby cannot actively wish for something yet ;-) But just a bank note or a gift card are kind of unloving - yet pimped with some Christmassy diaper babies your money gift will be awesome! Here is how to make diaper babies. 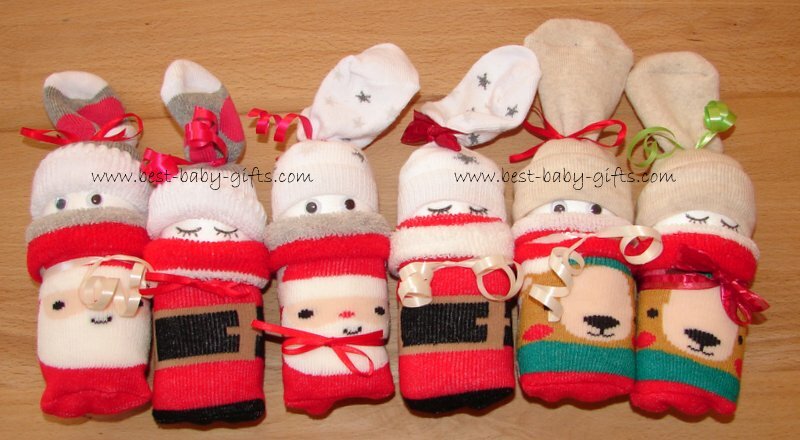 Here are some more DIY Xmas baby gift ideas. Not all of them are just for Christmas but many can be made to especially fit for Christmas by using winterly designs, Xmas colors and appropriate accessories. Sophie The Giraffe is one of the best organic teethers, if not the best! And now, there's a 'My First Christmas Teether And Ornament Set' available that makes a really cute present for newborn babies. The set even includes 2 Christmas ornaments. If you do not know Sophie yet, find all Information about her and her friends here. The workshop playset can even be personalized which makes it double cute and special. This singing Elmo toy made by Gund is so cute and your kids will love to get it out at winter time year after year! Elmo is wearing a green Santa hat and comes in a sleigh. Elmo sings 'Jingle Bells' and moves his mouth and head to the song. Such a riot for baby and the whole family! Always keep baby's little feet warm by giving those cute UGG boots or a pair of other sheepskin booties. UGG sheepskin booties are available for the very little ones already (size 0-1 months and up) and look very stylish on baby. UGG baby boots surely are pricey and parents might not be willing to pay this much for them. That's why they make a really special gift for a little one! A book always makes a great treat for whatever occasion and Xmas related books are great presentss for baby, too. They will love to look at these books for years to come. These all together also make a great baby book gift basket - and you might like to add a cosy pillow or a cuddly toy, too. Little People sets generally are for little ones aged 12 months and older. But you can give this set right after birth so next Christmas the baby / the toddler can play with it. The Fisher Price Nativity Set 'A Christmas Story' consists of a stable with stone walls and palm trees, the figures Joseph, Mary, baby Jesus, an angel, the three wise men, a donkey with a cart, a camel, a sheep and a cow. The star light up and the set plays 'Away in the Manger'. The set offers great educational value. And since the little one has its own nativity set to touch and play with, it might leave alone your valuable heirloom set. This cute nativity toy set will definitely be a hit with baby and the kids - Christmastime after Christmastime and year after year. Fisher Price also offer a cute range of special Holiday toys such as the Little People Musical Christmas Train, Xmas Village, Christmas on Main Street or Tree Lighting in Discovery Park. The Fisher Price Little People Xmas sets are interactive baby and toddler toys designed with loving attention to detail. They certainly will be fun to play with for years! This giftidea is for older babies of about 6 months and up and also for toddlers. What better winter and Christmas gift in snowy regions! It goes without saying that babies can't have downhill thrill rides yet but will love to be safely pulled around in winterly landscapes. Whether you go for a sled made of durable plastic material or a classical wooden sleigh with a backrest is up to you, and in a way also up to your purse ;-) Both can be used up to the age of approx. 4 years. If your baby is close to one year or if it is baby's 2nd Christmas, you might consider a soft doll. 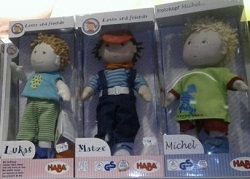 Dolls are suitable for girls and boys and there are also boy baby dolls available as the ones from German company HABA, pictured here. Soft dolls make cute and educational presents for baby and offer hours of play. Find more information on baby's first doll here. Most of my ideas on this page are somehow related to Christmas. Of course you can also give a 'non-Christmas related' gift for the Holidays, feel free to browse my other pages for more great ideas that will make perfect Xmas givings, too! And if the little one is not so little anymore, you might like to check out the best baby toys and my 1st birthday gift ideas. 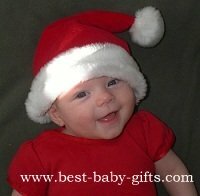 If you need a Christmas gift from baby for the whole family, check out lots of great ideas here.